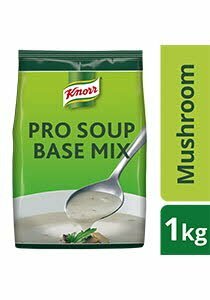 Knorr professional cream soup (Mushroom) is made with real mushrooms and selected high quality ingredients to deliver a creamy mushroom soup with consistency in preparation and taste. Permitted Modified Food Starches (Contains Sulphite, Wheat), Creamer (Contains Milk Derivative, Sulphite), Lactose (Milk Derivative), Iodised Salt, Chicken Meat and Fat, Maltodextrin, Permitted Yeast Extract, Permitted Monosodium Glutamate, Permitted Flavouring (Contains Egg, Wheat), Soy Sauce (Contains Wheat), Citric Acid, Spice. All food additives are of plant, animal and synthetic origin. May contain traces of cereals containing gluten, fish, crustacean, mollusc, peanut and tree nuts. 1. Sprinkle required soup mix into boiling/hot water. Whisk until dissolved. 2. Add in desired ingredients. Bring to boil. Simmer for 3 minutes. 3. Garnish and serve hot.